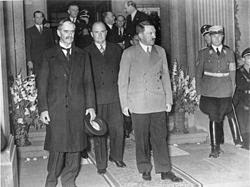 Much is made of docility, vulnerability and faith, which might all have been given a bad name by Neville Chamberlain who used the word appeasement to refer to his dealings with Hitler. There are some deeply spiritual beings whose demeanor is almost pugnacious. A dog is an interesting case in point. Dogs illustrate the organic provenance of the Stockholm Syndrome. Their devotion to their masters is a matter of self-preservation and there're pit bulls and other aggressive species of dogs whose inability to be trained demonstrates a certain level of spirituality. Imagine what it would be like to be a well-cared-for pet, say like the Maltese, Trouble, that Leona Helmsley left all her money to (“Cosseted Life and Secret End of a Millionaire Maltese,” NYT, 6/9/11) or one of those sensationally beautiful women like V. Stiviano, Donald Sterling’s now former girlfriend (“A Key Player in a Scandal. V. Stiviano Feeds the Media’s Appetite," NYT, 5/4/14). How much fun it would be to get all that lavish attention on the basis of doing nothing! On the other hand if you were that dog or that beautiful woman you might have a spiritual moment where the Stockholm Syndrome wore off and you turned against your owner.